I'm sure that by now, many of you have read Yitta Halberstam's recent article in the Jewish Press. In it, she bemoans the fact that frum young women are exacerbating the "shidduch crisis" by not taking every possible step (up to and including plastic surgery) to make themselves more beautiful for their dates and their mothers-in-law to be. Were they in denial about the qualities young men are seeking in future wives? Yes, it is somewhat disillusioning that men dedicated to full-time Torah learning possess what these girls might perceive are superficial values, but brass tacks: they want a spouse to whom they are attracted. The young men themselves might be too shy or ashamed to admit it, but their mothers won't hesitate to ask what for some is the deal maker/deal breaker question, namely: "Is she pretty?" A lot of lip service is given to the notion in Judaism that women aren't judged in shidduchim solely by their sexuality and appearance. Much thought and consideration is given, they say, to her character, her middos, her family and on and on. They point to pesukim which extol such ideals such as "Sheker haChain v'Hevel HaYofi." How much more beautiful and modest this is, they say, than in the "secular world" where women are viewed largely, if not solely, as sexual objects. Personally, I'm beginning to think that it's just the opposite. I don't know how many of you have noticed, but in the "secular world," there is no "shidduch crisis." I see lots of wedding photos and videos on the Internet. I've seen quite a few "proposal" videos as well. You know what? Girls who are less than gorgeous and who don't wear tons of makeup manage to become engaged and marry every day. Girls with "average" looks, girls who are overweight, girls who have physical handicaps, blind girls, deaf girls, and on and on. But what about Mrs. Halberstam's "deal maker/deal breaker" question of "Is she pretty?". Aren't men interested in looks? Don't men want wives who are pretty and attractive? The answer can perhaps be illustrated by a friend of mine. When he was dating, he had a list of traits (both physical and non-physical) that his future wife had to have. She had to be in a specific age range, with specific hair color, a weight range and on and on. He dated for a while, unsuccessfully. And then, something happened. He moved out of town and met, apparently on his own, a divorced mother fifteen years his senior. She was overweight and had the "wrong" hair color. And, yet, he was deliriously happy with her. He found his match. She certainly wasn't was he was looking for on the physical side, but he was so happy with her emotionally, mentally and spiritually that he simply put all that aside and decided that he loved her for who she was inside, despite the fact that she had all these qualities (older, overweight, divorced, mother) that would have caused her to be kept out of the "shidduch market." In other words, once he found someone he was happy with, the physical side of his "wish list" became less important and, perhaps, irrelevant. They're still married, fifteen years later. And that's exactly how it is in the secular world. Don't men want pretty wives? All other things being equal, perhaps they do. But people are willing to make trade offs. He loves her sense of humor, so who cares if she isn't a size two? He sees an inner beauty in her that attracts him, so who cares if she isn't well-endowed or has some crooked teeth? He loves the fact that she laughs at the corny jokes he likes to make, so he doesn't worry about her lack of high cheekbones. And on and on it goes every day in the "secular world." Women manage to find their mates despite not being physical knockouts, fashion models, D-cups, nose jobs and excessive makeup. In Mrs. Halberstam's shidduch world, however, the exact opposite is true. In her world, a man is so motivated by looks and appearances that if his potential wife is not pretty, it's unlikely (or impossible) that any other qualities that she may have can make him happy. So, she and other mothers like her stand as the gatekeeper to her son's dating world, weeding out anyone who isn't pretty, reinforcing the idea that such a "deal-maker/deal-breaker" question could or should even exist. To me (at least), that *is* the objectification of women. Rejecting, out of hand, girls who don't meet some standard of physical beauty is objectifying them. Pleading with girls and their mothers to wear lots of makeup and have plastic surgery to make them look better solely for the purpose of attracting a potential husband is objectifying women. Determining that a man cannot be happy with a girl who isn't a stunning beauty is further objectifying them. It's a shame when men do it, but it's doubly shameful when women do it to other women. And it puts the lie to the idea to the idea that shidduchim are not about physical beauty but about middos, etc. I've been married to Eeees for over twenty years. On the day we first met (Friday, Feb 26, 1988), she was not wearing any makeup. She didn't wear any on our first date, our second date or on any other dates. To this day, she barely wears any makeup. I can say, with complete confidence, that I have *never* seen her out of the house with lipstick. Furthermore, when I met her, she wasn't a size two or a size four, or even a six or eight. She did not have the face of a fashion model. Nonetheless, I was completely swept off my feet by her. I will admit that *I* find her incredibly beautiful physically, but it wasn't her physical beauty that won me over. It was her sweetness, her gentleness, her sense of humor, her middos and her warm, wonderful heart that won me over far more than her appearance. No, Mrs. Halberstam... physical beauty was not a "deal-maker/deal-breaker" for me. Nor is it for billions of non-frum/non-Jewish men (who aren't shallow jerks) around the world every day. It's a shame that, in this area where we claim to have superior values to the rest of the world, we find ourselves asking "Is she pretty?" as a "deal-maker/deal-breaker" question before going any further. Does the Flatbush Jewish Journal Contradict Itself? This week, there is going to be a special election for a district in the New York State Senate. This district is located in Brooklyn and covers a significant portion of the Jewish population in Brooklyn. 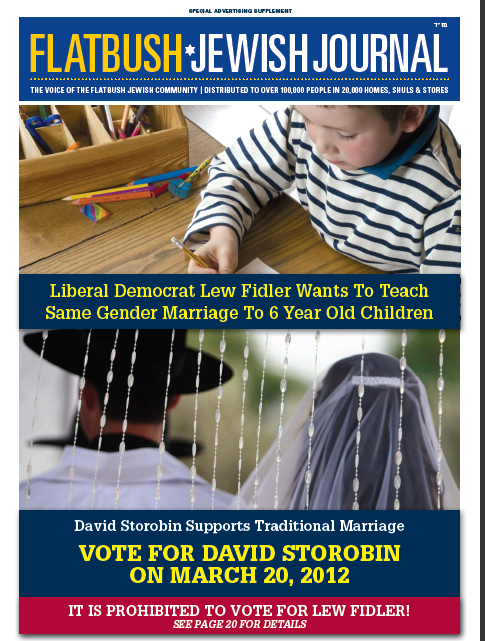 As you can expect, there is a significant amount of political maneuvering going on, with the two candidates -- Lew Fidler and David Storobin, looking to secure rabbinical endorsement. 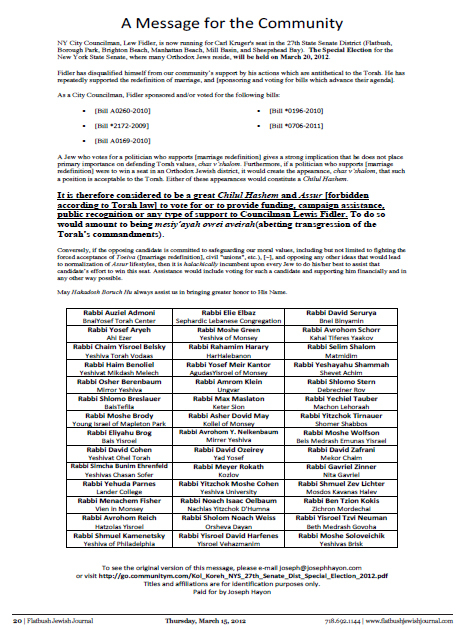 The Flatbush Jewish Journal, a community newspaper known for it's right-wing leanings, put a notice on the front page of the latest issue stating "It Is Prohibited To Vote for Lew Fidler." 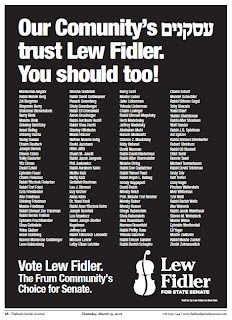 The cover directs you to an advertisement on page 20, where a list of 42 prominent rabbis, including such names as Rabbi Chaim Yisroel Belsky, Rabbi David Cohen, Rabbi Shmuel Kaminetzky and others, state that it is forbidden to vote for Lew Fidler. The exact wording of the advertisement states that because of Mr. Fidler's votes concerning gay marriage "It is therefore considered a Chillul HaShem and Assur [forbidden according to Torah law] to vote for or to provide funding, campaign assistance, public recognition or any type of support to Councilman Lewis Fidler. To do so would amount to being mesisy'ayah ovrei aveirah (abetting transgression of the Torah's commandments)." The document with the original signatures can be seen here. Pretty powerful words, if you ask me. 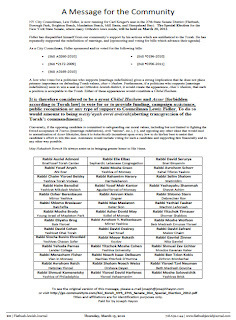 In short, it is forbidden to do anything to help Mr. Fidler win the election according to these leading Rabbanim. Except, perhaps, accept an advertisement in support of Mr. Fidler, because that's exactly what the Flatbush Jewish Journal did. 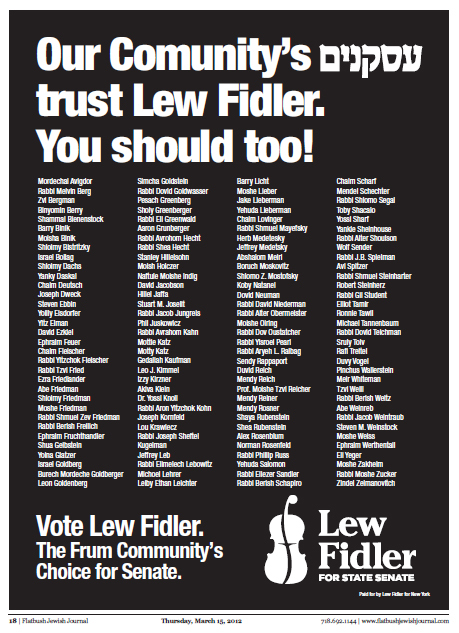 On page 18 (which is right before the ad above), they have an advertisement listing people who support Lew Fidler. One of the proofs that is commonly given to the authenticity of the Giving of the Torah at Mt. Sinai is the Kuzari Principle, as outlined by R. Yehuda HaLevi in his book HaKuzari. The crux of the proof is (in oversimplified short form) that the story of the Revelation was witnessed by millions of people and the knowledge of that information was transmitted from parent to child, generation after generation. Anyone trying to invent such a story anywhere along the way would have been proven a liar, hence the story must be true. There are a number of problems with the Kuzari Principle, which I don't really want to get into in this post. Instead, I want to address one particular point in the argument -- the transmission from parent to child. This transmission is vital to the proof. Implicit within the argument is that the child hears about the from their parents... or, in other words, that the parents/teachers are the transmitters of the information. This differs from, say, reading information in a book which could have been written by anyone and may or may not contain the truth. However, I've got to wonder if we haven't reached the stage where most people's primary knowledge about the Revelation isn't from their parents but is, in fact, from the Torah itself. If their knowledge of the Revelation comes from having read the Torah and not from their parents, then how is it different than anything else read in a book? Or am I making some sort of a logical error here?